This is one of the nicest Bel Airs we’ve had the pleasure of promoting! There was over $100,000 put into the build and it is currently insured by Grundy Insurance for $87,000. 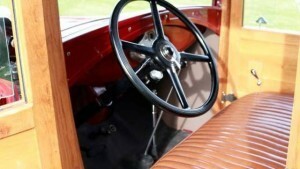 Zero corners have been cut in the restoration of the car and the highest end parts have been used throughout. 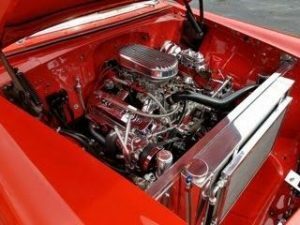 Under the hood is a 383 8 cylinder engine with 15,000 miles on it, a 700 R overdrive automatic transmission. 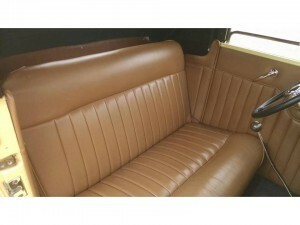 Red exterior, hazelnut brown leather interior. Cadillac CTS power seats, power windows, power steering, and disc brakes all around. 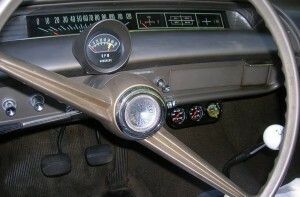 AM/FM radio, Vintage Air, records/receipts have been kept, well maintained, and always garage kept. 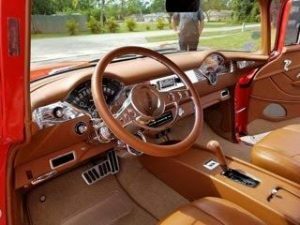 Texas vehicle, Mercedes Benz carpeting, 355 gear in the rear, English Wool headliner, ultra leather, rust free with no patched panels. Trophy-winning and has been featured in magazines! Dually spring in the rear, Roll over shocks, drives like a brand new car, ATI distributor, Mild cam, 2 x 4 Edelbrock carburetor. 25-gallon gas tank, new battery AC compressor, 400-watt stereo system, 4 new Michelin tires, Boyd Coddington wheels.Electric wipers, new mufflers, and exhaust. Clean title, fresh fluids and ready to be enjoyed. This is an amazing car for shows, parades, cruises or summertime driving! Please call Jim at the number above to ask questions, see the car, or to make an offer. 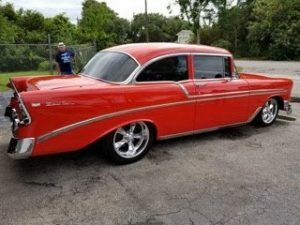 You will not find a better 1956 Bel Air for this price at this quality. Thank you all for looking! This is one of the nicest Bel Air Chevrolets we’ve had the pleasure of promoting! There was over $100,000 invested in this car and it is currently insured by Grundy Insurance for $87,000. The vehicle came from South Texas, rust free. 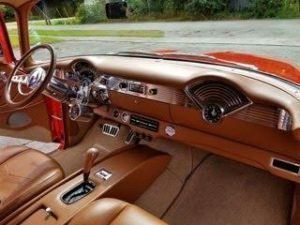 Red exterior with “Pecan” genuine ultra leather interior, English Wool headliner (including the trunk), Cadillac CTS power seats, power windows, power steering, power disc brakes. AM/FM radio 400 watt amp. Well maintained and always garage kept. Clean title, fresh fluids and ready to be enjoyed. This is an amazing car for shows, parades, cruises and summertime driving! Please call Jim at the number above to ask questions, see the car, or to make an offer. 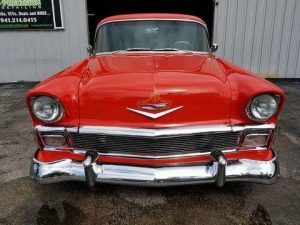 You will not find a better 1956 Bel Air for this price with this quality.